There are not many times in a person’s life when they know precisely what they were doing on a particular day and time; the time you took your wedding vows, the birth of one’s children or the moment news reached you of 9/11 are probably the only events most people can accurately pinpoint in their lives. Well, I know for a certainty what I was doing at 10.00 am on Saturday 1st January 2000. For while the rest of London was sleeping off the previous night, I was planting a Aesculus hippocastanum seed or a conker to you and me, or should I say a number of conkers. IN A RARE SURGE OF OPTIMISM, I went out on a cool overcast day and planted my conker to mark the start of a new millennium. 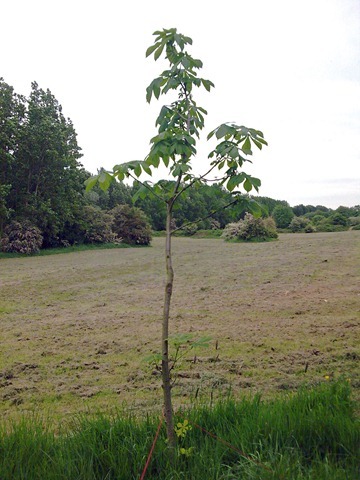 Now thanks to the good offices of my local Tory councillor, my three-metre high Millennium Tree has been planted in our local park, and God (and yobbos) willing, will grow and give generations of children pleasure. I only give this fascinating snapshot of my life because recently I’ve been reading The Great Trees of London by Jenny Landreth, for according to the author there are only 56 trees exceptional for their height, girth, reach, age or rarity. London planes are estimated to make up around 50 per cent of the capital’s trees, with tough shiny leaves readily washed clean in the rain and bark that is able to renew itself by peeling off in small plates has made it an ideal tree for London’s polluted atmosphere. This beauty, according to the author, has been left free to grow to its full glory, ignoring any health and safety issues regarding low hanging branches. A large semi-mature London Plane, planted around the time of the opening of the Dorchester Hotel. Standing in Park Lane it is probably London’s most famous tree as its beautiful form and shape are dramatic when lit up at night. On 8th July 2005 Dean of Westminster Abbey, Dr. Wesley Carr laid a wreath on the memorial to Innocent Victims at the Abbey to remember those who had been killed or injured in the bombings the day before. The wreath contained London Plane leaves from the tree that stands close to Westminster Abbey symbolizing London. Standing at the junction with Horse Guards Avenue, this area has some fine examples of London’s ubiquitous trees and this is the finest example lining this major thoroughfare. This tree in Berkeley Square with a known planting date of 1789; in 2008 it was valued at £750,000 making it Britain’s most expensive tree. Despite the popularity given by the song, A Nightingale Sang in Berkeley Square, this drab square, is redeemed by over 30 enormous plane trees planted at the same time and are among the finest specimens in the whole of London. An elm on Marylebone High Street [pictured] which survived bombing in World War II (which destroyed the adjacent church and has since been spared the threat of Dutch elm disease, making it the last Elm tree standing in Westminster. An ash in the graveyard of St Pancras Old Church, reputed to be the oldest church in Britain; King’s Cross was being regenerated in the 1860s, at this time the exhumation of human remains and the removal of tombs was supervised by the architect Blomfield, although he delegated much of this unpleasant task to his young protégé, Thomas Hardy. The tree is known as “The Hardy Ash” has since grown around the gravestones. Great trees have always made London beautiful; they lined the roads, they were planted on the banks of the Thames, they were grown in the gardens of great houses and in the newly created garden squares, so where are they all now; St John’s Wood is no more, are we losing our botanic heritage? Mature trees are supposed to be protected by preservation orders and even the most necessary and responsible pruning requires the display of notices of intent and consent from local planners, but these often useless safeguards are easily ignored. Trees are beautiful, mysterious, and remind us of our insignificance among the natural wonders of the world; all planning officers should insist that developers plant trees that will grow big, tall and wide in future developments, the 2012 Olympic site should have as its legacy a vast number of mature trees to soften the coldness of it architecture, we for our part this autumn should go about with pockets full of acorns and conkers, to plant trees to make our city more beautiful for our grandchildren. More information on trees and their contribution to the urban environment can be found on the excellent site Trees for Cities. A most excellent post! I am tempted to go and visit some of these behemoths meself. Thanks. My favourite is the Marylebone Elm which I’m pretty sure the high street has been routed to accommodate this magnificent specimen of a tree once common in my childhood.